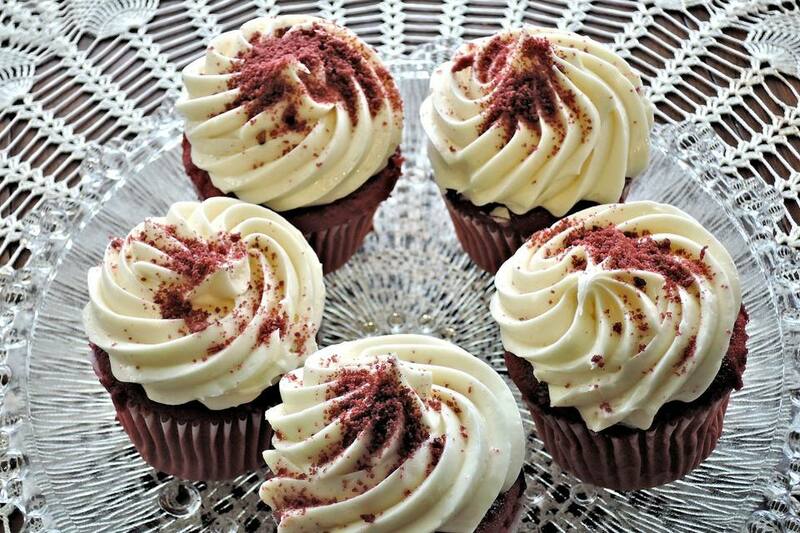 Red velvet cupcakes are perfect for a lot of occasions, from Christmas festivities to school parties to everyday sweets. Feel free to dress up your finished creations with red or chocolate sprinkles, or just use a healthy dose of dairy-free frosting! Preheat the oven to 350 F. Line 2 12-cup muffin tins with cupcake liners and set aside. In a medium-sized mixing bowl, sift together the flour and salt. Set aside. In a large mixing bowl, use an electric hand mixer to cream the margarine until smooth. Add the sugar and beat until fluffy. Add the eggs, one at a time, beating until incorporated. Add the food coloring, cocoa powder, and vanilla, beating until smooth and well-combined. In a small bowl, stir together the dairy-free soy yogurt and soy (or almond) milk. Add the soy yogurt mixture to the margarine mixture in several additions, alternating with the flour mixture until all has been added and the batter is well combined. ﻿In a small cup, whisk together the apple cider vinegar and baking soda, and add immediately to the batter, beating until the batter is well-combined and smooth. Portion the batter into the prepared cupcake liners, filling each about 2/3-3/4 of the way full. Bake for 18 to 22 minutes, or until a toothpick inserted into the center of a cupcake emerges clean. Allow cupcakes to cool completely on a wire cooling rack before frosting with Dairy-Free Cream Cheese Frosting or other Dairy-Free Frosting of your choice. Serve cold or at room temperature.